Kayli, an Operations Specialist at Knowmad Adventures, and her partner Evan followed the path of one of our favorite Chile and Argentina combination itineraries. 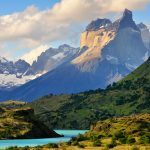 They began in Argentina’s colorful capital city, Buenos Aires, traveled south to the glaciers and mountains on both the Argentine and Chilean side of expansive Patagonia, and topped it off with a quick stop in the Lakes District before departing via Santiago in Chile. Read on for their best-loved moments, dramatic photographs, what they learned, and more. Visiting Chile and Argentina for two weeks was a bit of a break from my usual routine. Typically, you can find me in the Knowmad office in Minneapolis, helping craft unique and custom trips to South America for Knowmad travelers. But every once in a while, my ‘office’ becomes a suitcase. My work became “travel through Chile and Argentina for two weeks.” I met with our partners, researched the places we champion, and tested out new excursions. 20,160 minutes of adventure. These minutes were filled with laughing conversations, exciting discoveries, and ‘pinch-me’ memories. Some of these moments I shared with others, while others are uniquely mine. Travel is enriching: an opportunity to learn more about a place, a culture, and yourself. As I explore, I like to pick just one or two moments from each day, and record them in a travel journal. It’s nothing elaborate, just a normal notebook with pages enough to jot down crazy facts I don’t want to forget or funny stories to laugh about later. Although I originally wrote my travel journal entries for myself, I’d like to share ten moments with you from my most recent trip to Chile and Argentina. These are moments that in some way, big or small, enriched my travels. And for those who ascribe to the belief that a picture is worth a thousand words (like myself), I’ve paired these memories with personal photos from the trip. I hope you enjoy these glimpses into “a-week-in-the-life” of a Knowmad travel specialist! We absolutely loved our adventure to Chile and Argentina. Both countries are places to do something completely extraordinary, like jump inside a glacier, and things completely ordinary, like take a drive. Traveling lets you do both. I’ve found that it’s a lot better to do things, than to talk yourself out of them. The views from the top are just too good to miss. Are you ready to make memories and write in a travel journal of your own? To plan your own custom South America itinerary, give our Trip Specialists a call at 612-315-2894 or send us an email today! Kayli is an Operations Specialist at Knowmad Adventures, a company dedicated to creating unique, private and custom trips in South America. She has danced, swam, zip-lined and hiked all over Central and South America and is always excited to help others dream and plan their adventures. Read Kayli’s biography and others to learn more about the Knowmad team.